Inside Odile. Photography by Rémi Thériault. 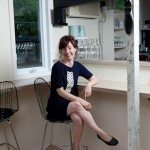 In 2010, Marysol Foucault opened a little sandwich bar in Gatineau called Chez Edgar. Almost overnight, the 11-seat food shop — more like a gastropub disguised as a girly lunch counter — quietly became a gourmet destination, attracting fans from both sides of the river. Long weekend lineups were one reason Foucault sought a second location. Another was her desire to serve dinner. 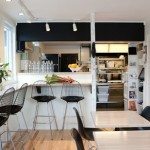 She found a spot with a closed kitchen and a large patio located five minutes’ drive away and, in May, opened the restaurant Odile. 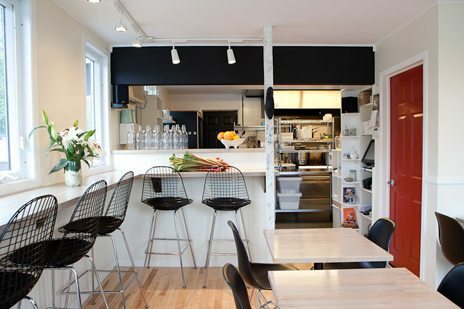 Not much bigger and no closer to downtown, Odile is another oasis of taste in a neighbourhood built for utility. Like Edgar, it’s a place where Foucault can express her passion for beauty and balance, freshness and seasonality, and the significance of tiny details. Like at Edgar, Odile’s menu is concise and changes weekly, but Foucault’s approach to Odile seems grounded in the conviction that we must come to terms with our limits. Looking up at the work of art she created for the new space, Foucault becomes wistful. It’s an old-fashioned player piano roll upon which she has created a timeline decorated with a constellation of pins and fine red thread. “It’s about time and memories. These happen in clusters,” she explains. “Sometimes there’s a lot happening and other times less. 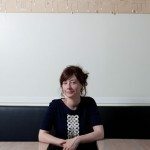 They all make you what you are.” Odile, 47, rue Montclair, Gatineau (Hull sector), 819-205-4425. A peek inside Odile reveals a space that is both sleek and cozy. Photography by Rémi Thériault. A small sign by the door lets you know you’re in the right place. Photo by Rémi Thériault. 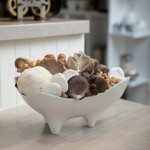 A dish filled with an assortment of mushrooms makes for pretty, culinary-themed decor. Photo by Rémi Thériault. 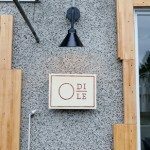 The menu changes weekly at Odile. 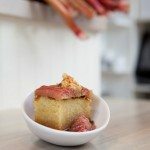 On the day the photographer stopped by, he was smitten with the seasonal almond cake with poached rhubarb. Photo by Rémi Thériault. 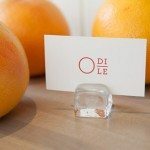 It’s all about the little touches: a business card boasting Odile’s unique logo. Photo by Rémi Thériault. Hot on the heels of the success of Chez Edgar, Marysol Foucault has launched Odile, another tiny oasis of taste just five minutes from her original restaurant. Photo by Rémi Thériault. Marysol Foucault sits in front of a work of art she created. The piece is an old-fashioned player piano roll upon which she’s created a timeline decorated with pins and fine red thread. Photo by Rémi Thériault.